I own many, I'm really embarrassed to say. I'm one of those guys who gets really spaced out, goes down the street, and finds a piece of nothing on the wall that in my inflated condition looks like something I can rebuild at home, so I've got a lot of junk. 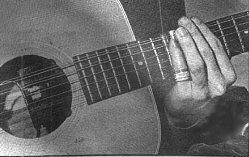 The bottleneck is worn on Kottke's little finger (photo by Gil Podolinsky). In addition to the two playable Gibsons, I have eight other B-45s that are my experimental victims that are basically pieces of junk. 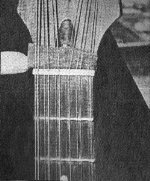 I also have four Bozos; one 12-string is about six or seven years old, and the other, a cutaway, about three. Then there's the new one with the smaller bell, and I also have one of his 6-strings. I find that I no longer like guitars with a lot of inlay. It seems more fitting to have the plain, straight line. I also have the Martin Conversion I mentioned. Then I have a Mark Evan Whitebrook [since retired] and a David Russell Young [shop located at 7134 Balboa Blvd., Van Nuys, CA 91406]. Those two shared a shop for a while. They're really nice classical guitars, both with cedar tops. I got them from Fred Walecki at Westwood Music [1611 Westwood Blvd, West Los Angeles, CA 90024]. The Whitebrook used to belong to Art Linkletter's son. The Russell Young needs to be reseated -- the neck has tipped and needs to be tipped again. I love shopping around. For seven or eight years either me or my henchmen would call all over for the B-45s. Most people don't like that guitar, it's not a collector's item. It's one of those axes everyone strung too heavy, and it would fall apart. Would you go to Gibson and have them build a B-45 with a Bozo bell shape? Sponge rubber under the strings eliminates extra resonances (photo by Gil Podolinsky). No, I'd have them rebuild the B-45-12N that I got from them in the early Sixties. Hopefully I'd be able to bring my own wood. This one I'm playing now has plywood back and sides, which I think was how they built them at the end of their production. The original B-45 had mahogany back and sides with a spruce top. This current one didn't sound very good when I started playing it, but I've played it a long time, and I'm becoming pleased. It really has come to life. People leave guitars sitting around, and don't know that the instruments can really improve if they're constantly played. Bozo uses sitka spruce from Washington for his tops. Does that make a difference from the sound a 12-string gets when European spruce is used? 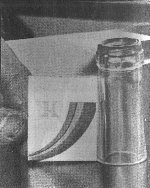 Kottke's slide (photo by Gil Podolinsky). Well, Bozo and I think that European spruce is too fragile, plus there's not much of it left. The most important thing I found out about a top, especially a twelve, is that it has good silk. You have vertical grains, but there's a grain called silk that goes straight across. You get it when you have the right kind of wood first of all, and a perfect quarter cut. That makes all the difference in the world because if you've got good silk everywhere, that means the wood isn't torquing very much. So going vertically, it will stand pretty straight. A tree eventually twists doesn't it? But Bozo's construction is achieved by the use of a big cross brace with delicate bracing elsewhere. It doesn't look standard at all. He uses thicker spruce and arches his top just a bit so there's a bubble; a slight bell to it. Do you feel that most guitars are built for durability rather than sound or quality? Most certainly. I don't care if a top warps or braces fall out. The only thing that matters is if it sounds good and is playable. I know that the bulk of guitars sold are in the $300 or less category and are real shiny, new, with no scratches and are made durable enough to live in.